To illustrate the usefulness of notching we designed the following experiments. We vibrated a lawnmower blade on a shaker with accelerometers on the shaker head and one on the end of the lawnmower blade (Figure 1). We ran four tests on the mower blade/shaker system. 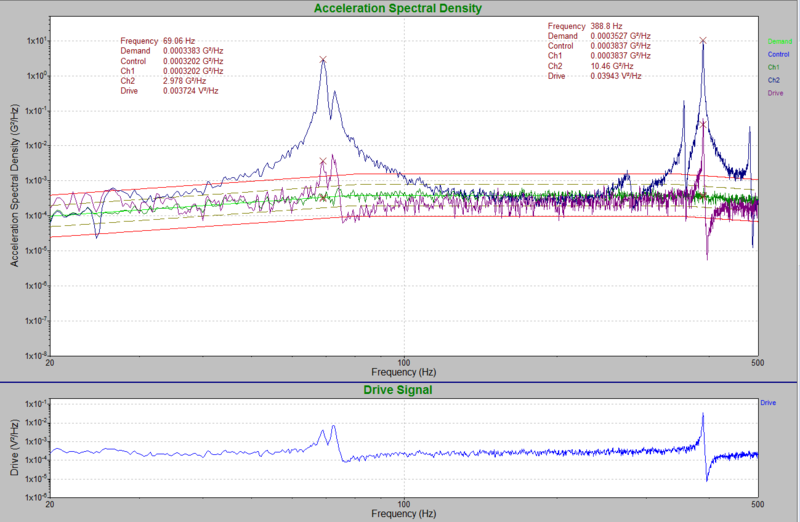 For each test we ran a modified NAVMAT profile which ramped up from -20 dB to full level. An accelerometer was mounted on the head of the shaker and one on the end of the lawnmower blade. In test one, we controlled off the shaker head with no notching. In test two we controlled off the shaker head with notching. In test three we controlled off of the end of the mower blade and had no notching. Finally, we ran a test on the shaker head alone to see the effect of notching on a control channel. During the first test we ran the test with no notching on channel 2 (end of lawnmower blade) and controlled off the shaker head. 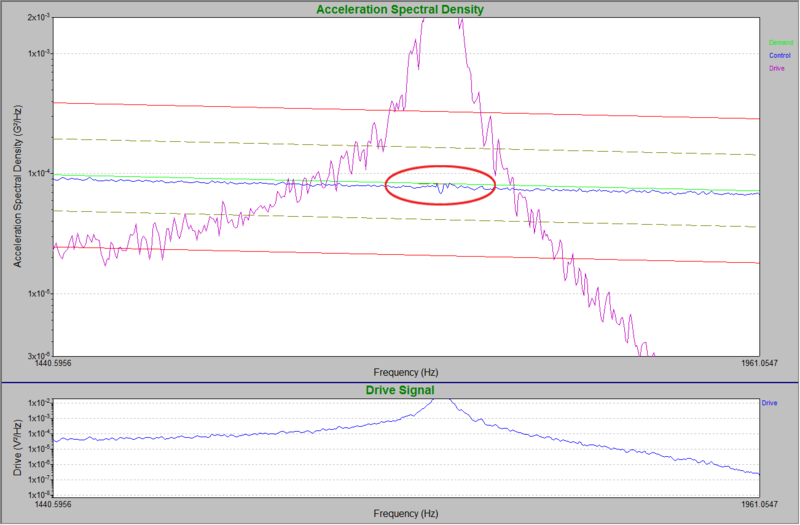 Notice the large resonances on the mower blade in the 70-80 Hz range and again in the 300-400 Hz range (Figure 2). Figure 2: NAVMAT test on lawnmower blade with no notching. Note the large resonances on Channel 2. 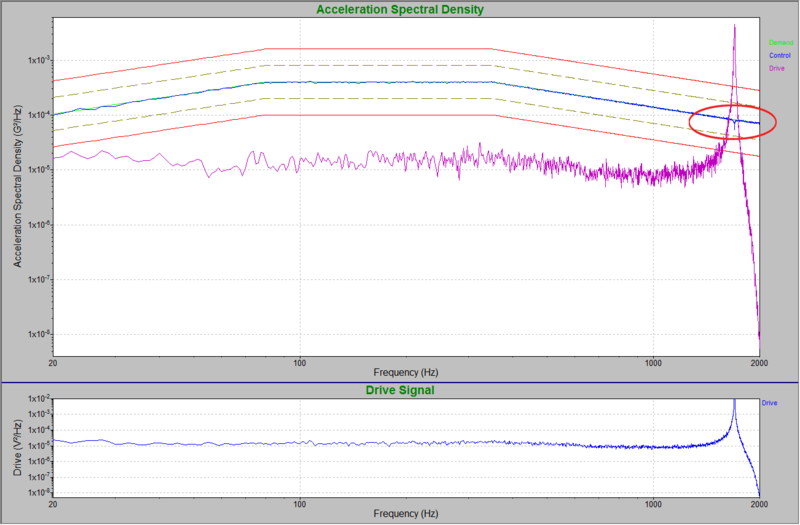 We then reran the test with a notch at the 65-95 Hz range for Channel 2 (lawnmower blade). We set the amplitude level at 65 Hz to 0.0025 G2/Hz and at 95 Hz to 0.0055 G2/Hz. In doing so the large resonances (2.98 G2/Hz) that were found in the original test (Figure 2) are limited by the notch (Figure 3). 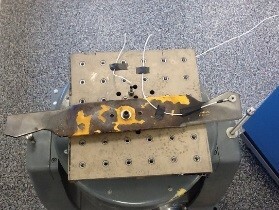 Figure 3: NAVMAT test on lawnmower blade with Notching at 65-95 Hz for channel 2. Notice how the large resonances in that range are limited to the notch level. In the third scenario we again ran a test with no notching. But in this case we controlled off of Channel 2. When doing this, the drive compensated in such a way as to keep the large resonances in the lawnmower blade to a minimum (within the tolerance and abort lines) (Figure 4). To do so, the drive signal has large dips at the 65-95 Hz range (similar to when notched – see Figure 3), as well as in the 300-500 Hz range. Figure 4: NAVMAT test on lawnmower blade with Control on the end of the lawnmower blade (Ch. 2) with no notching. 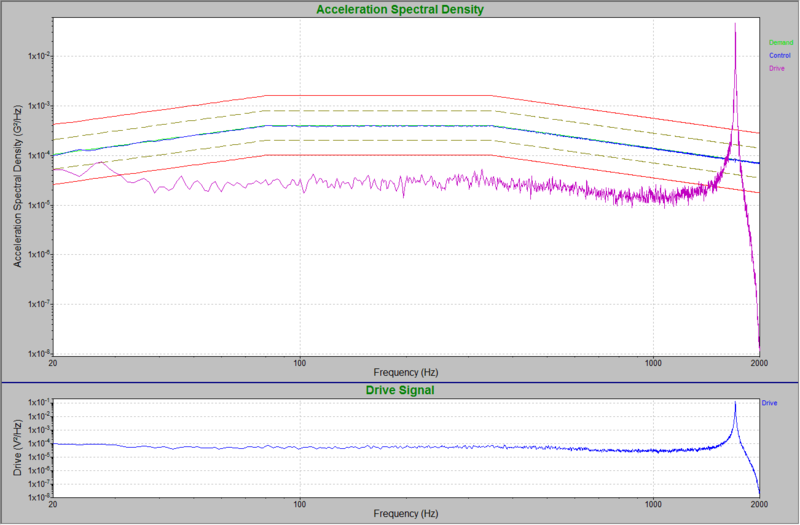 Notice how the large resonances of the lawnmower blade are reduced across the PSD spectrum (blue Ch2 plot). 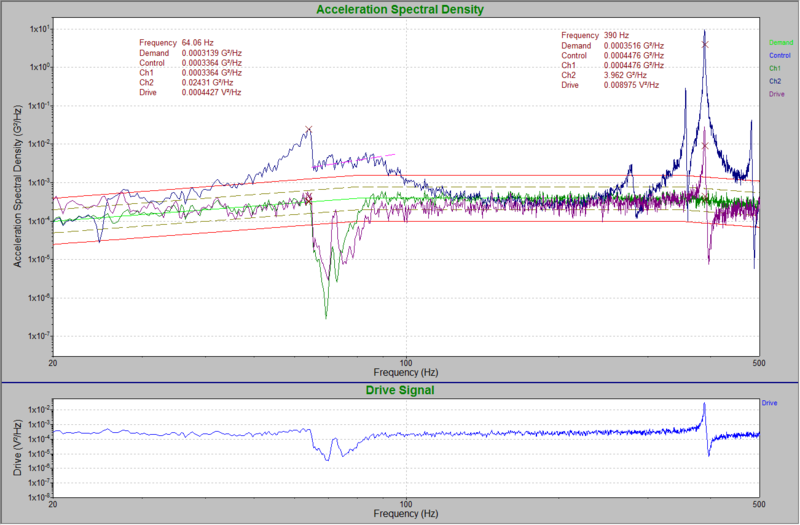 This is accomplished by the low level drive signals for those resonances. In the final test, we ran a NAVMAT profile on the shaker head alone (with no products on it). We determined that the shaker head had its own resonance at approximately 1700 Hz (see Figure 5). We then put a notch (boost) at the shaker head’s resonance (1690-1715 Hz) (Figure 6 and 7). With this test, it can be seen that the drive signal without the boost (Figure 5), produces the exact same outcome as the boost does (Figure 6). Figure 5: NAVMAT test on shaker head. Shaker head has a resonance at approximately 1700 Hz. Figure 6: NAVMAT test on shaker head with a boost (notch) at 1690-1715 Hz. Figure 7: NAVMAT test on shaker head with a boost (notch) at 1690-1715 Hz; zoomed in. When discussing notching it is appropriate to separate the discussion into two subtopics: the benefits of notching for response channels and the benefits of notching for control channels. The main benefit of notching from a response channel perspective is that the test engineer can set boundaries for large resonances that may appear in a test of a specific product. With the notching, the test engineer avoids those resonances but can still test other resonances (Figure 3). In that example the low frequency resonance (70-80 Hz) was eliminated, while the higher frequency (300-400 Hz) was still tested. Some advocate that the drive already compensates for the resonances in a product, and therefore, there is no need for notching. Although controlling on the end of the lawnmower blade (rather than on the head) seems to reduce the drive input and control the resonances on the lawnmower blade, it does so across the entire frequency spectrum (Figure 4). This is not desirable. Reducing the resonances in this manner affects the entire frequency band rather than the narrow frequency band of the one or two resonances of interest. As can be seen from our final set of tests, there is no need to utilize notching when dealing with resonances for control responses (shaker head). The notch we set across the 1700 Hz resonance of the shaker head (Figure 7) was compensated in the exact same way by the drive when there was no notch in place (Figure 6). In conclusion, notching is very helpful for dealing with unwanted resonances on response channels. Test engineers ought to use a notch on a response channel to avoid a particular resonance when they want to test a product’s other resonances. 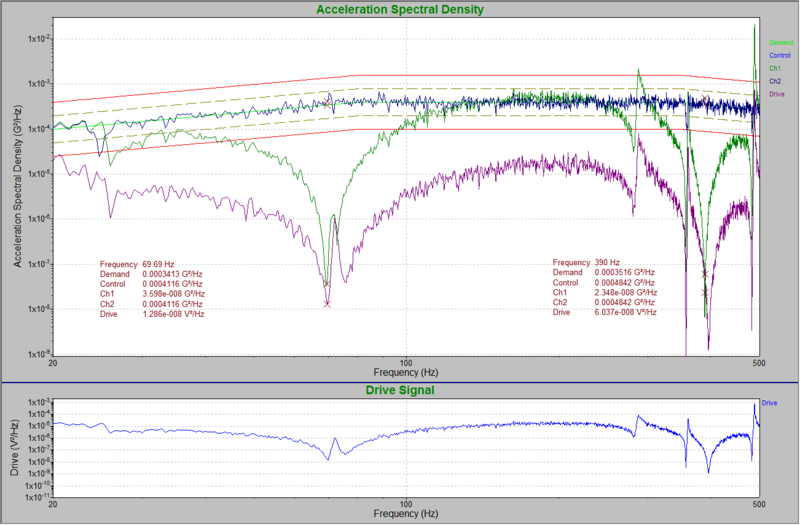 Although the drive compensates for resonances in a product, it does so across the frequency spectrum. Therefore, it is wise to use notches in appropriate locations in order to avoid testing around unwanted resonances but still be able to test other desired resonances. But as far as control channels are concerned, there is NO NEED to use a notch because the drive signal accomplishes the same goal as the notch on the control channel.